How do we know when a drug or a treatment for an illness is suitable for testing in humans? Will it significantly improve a patient’s prognosis or help them recover? These are some of the difficult questions that researchers need to get right in order to minimise the risks and costs of a clinical trial and where animal models become essential to help answer them. However, researchers need to be aware of the limitations of models. Animal models are necessary in research to understand the origin of some diseases and to help test candidate treatments in a living body. Where possible, researchers try to use alternatives but the communication between cells, tissues and organs in response to a particular mutation or treatment is something that cannot be adequately recapitulated by a Petri dish. 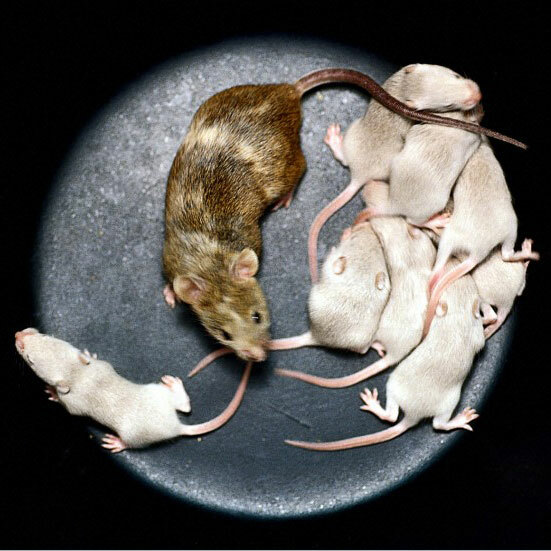 There are many animal models researchers use depending on their needs, but out of all of these, mice are perhaps the best known and the most widely used. Mice and humans are, despite their very different appearances, quite similar; some estimates put the number of genes conserved in both species as high as 95 per cent. This has allowed scientists to study many diseases in mice, for instance cancer, and make promising discoveries. Even though mouse models of cancer are inbred and genetically engineered to contain potent driver mutations, which represents a somewhat unnatural beginning to the disease, they have produced a number of successful results. To cite some examples, we know from looking at breast cancer in mice that often the same genes are known to drive tumours in humans. Paired-end sequencing of mice breast tumours carrying conditional alleles of known cancer genes like Trp53 or Brca1 have shown key features associated with the cognate human tumour type, including mutations and alterations found in human tumour cell lines. We have learned similar lessons from mouse models in leukaemia. Sequencing of tumour-germline pairs from transgenic mice carrying the PML-RARα fusion oncogene, which is used as a model of acute promyelocytic leukaemia, has revealed somatic alterations in genes like Jak1 and Utx that mirror the mutations found in human leukaemias. These and many other examples illustrate the usefulness of modelling human cancer in mice to identify important alterations driving cell transformation and proliferation. Despite these success stories, scientists must be cautious when translating findings in mice to humans. Some of the gene mutations, duplications and deletions observed in human tumours haven’t been replicated by studies in mice. Moreover, it is well known that mouse chromosomes are structurally different to human chromosomes and that some features, like telomere crisis and some requirements for cell transformation, are different for human and mouse cells. These facts demonstrate that, although we can infer the origins and progression of human cancer to an extent using mice as a model, there are still many biological processes that are specific to each species and which have to be taken into account when translating findings across species. There are many methodologies that researchers use in order to help the interpretation of results in an animal model. DNA and RNA sequencing and chromatin immunoprecipitation are commonly used to detect mutations, assess gene expression and find sites important for DNA-protein interactions. Also, computational tools have been developed to align protein sequences across species, to compare syntenic fragments of the genome and to lift genome coordinates from one species to another. In the coming years, these and other tools should help us understand better how well our models recapitulate human cancer, and hopefully, aid in building even more accurate models. Daniela is a PhD student in the Experimental Cancer Genetics team under the supervision of Dave Adams. Varela Iet al. (2010). Somatic structural rearrangements in genetically engineered mouse mammary tumors. Genome Biology. doi:10.1186/gb-2010-11-10-r100. Wartman L D et al. (2011). Sequencing a mouse acute promyelocytic leukemia genome reveals genetic events relevant for disease progression. The Journal of Clinical Investigation. doi:10.1172/JCI45284.